January 04th 2007 - I was surrounded by darkness, a darkness produced by wearing a bandanna blindfold. It created a sensation similar to having my fingers in my ears, but this time it was a visual “silence” with my eyes closed, instead of a silence produced by plugging my ears. The music was loud and tribal, with passionate rhythms that I could feel all over my body. It was as if all of the cells and neurons in my body were responding spontaneously to the music. The darkness was so beautiful, supportive, and complete, and I wasn’t dancing with anyone and no one was dancing with me. I could not control my body. It was simply responding spontaneously to the music. Sweat was pouring down my whole body and at times I could not even feel my body…I was alone dancing in this darkness. I was Trance Dancing! If we look at Shamanic practices from all over the world, we can clearly see that our original relationship to dancing and movement was for the purpose of connecting with a Higher Self, to worship, and to heal. Our ancestors viewed nature -- the earth and all of its elements -- as sacred, as an expression of God and the Divine. The goal, then, became to duplicate nature, to mimic what we saw as a part of creation of life and death. To duplicate nature through movement and sound was the first and most powerful way to connect with God and Spirit. We learned to use our bodies as the instrument that could carry the energy and the vibration to make this possible. We learned how to dance to ecstasy, to celebrate with our bodies that we were alive. 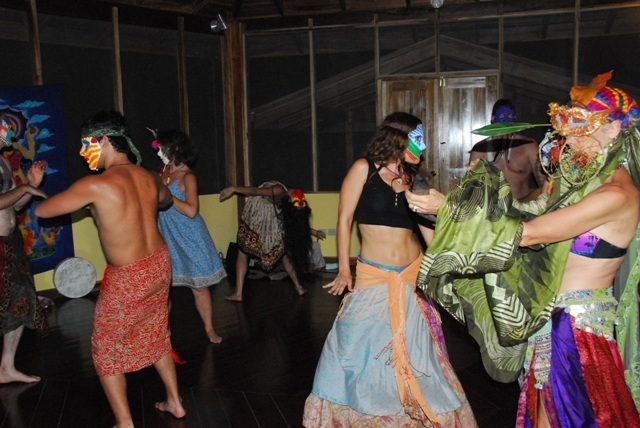 Spiritual dancing is a cross-cultural phenomenon. It is something that we witness in all cultures from every continent on this planet, each simultaneously embracing unique dance forms based on that particular culture’s environment, their perception of reality, and the animals and elements of nature present within their domain. Their purpose in dancing has universally been to enter the consciousness of, or become the spirit of, the sun, moon, and various animals and forms of plant life. It was to call in the spirits or to drive them away. Indigenous people -- and we all come from indigenous people -- have been called the guardians of the Earth. It is an apt description and goes beyond a mere acknowledgment that indigenous people are respectful of nature and it’s resources. Indigenous people are descendants of the original inhabitants of the planet that have been colonized or overrun by others. But even then they have not lost their passion for dancing and expressing their connection with the Earth and with Spirit through Ritual Dancing. We have some beautiful examples from around the world, including many Native American nations from the US and Canada, the aborigines of Australia, the Maori of New Zealand, the Saami of Northern Scandinavia, people from innumerable oceanic islands throughout the globe, and more. We have examples of their ritual music in the Balinese Keckak, the Hawaiian Hula, the Kayapo from Brazil. The beautiful Wodaabe from North Africa chant, clap, drum, and dance for seven days in ritual and pleasure. The instruments that are used also play an important part of the Ritual Dance and the induction to an altered state of consciousness. We have instruments like the drum that mimics the heart beat, the didjeridoo, rattles, the human voice as is used by Tibetan Tantric singing…all are used to drive us deeper within the self. Through these dance rituals, participants believed that the spirits within nature could empower them with abilities such as courage and compassion, as well as reveal insights into the future. After my experience with Tribal Trance Dance I can say that this is indeed true. The sense of empowerment I felt as the result of running with my black panther friend and animal guide, and the way my body felt: this is very likely quite similar to what native people feel like after one of their rituals. Dance is synonymous with Prayer, a demonstration of reverence. Dance is a doorway to the soul or spirit within and if you dance into the state of ecstatic trance you will connect completely to the healing powers of Spirit. Trance Dance is pure ecstatic energy. Trance Dance is the vehicle by which you become that energy and that's what makes it remarkable. At the level of Spirit, anything is possible. Trance Dance is meditation in motion, the vehicle that takes you from outward to go deep within to explore and be an active participant in that exploration. We use the body as an instrument of the Divine, and we engage in the exploration of our feelings and emotions, aided by music and the breath. Akashic Records classes and workshops (all levels), Hot Stone Massage classes and therapist certification programs (three levels), Karmapa Reiki Classes Level I, II and Master, CEU’s offered for all classes. Psychospiritual Integration Workshops are also offered, including: Integrative Breathwork, Transformational Breathwork, SERT (Somato emotional Repatterning Therapy), Shamanic workshops, Trance Dance, and more. Ernesto has been in private practice and teaching in Miami, Florida for 14 years. He has facilitated numerous workshops and seminars in the US, Canada, Puerto Rico, Australia, and the Caribbean, and he has been featured in magazines like Allure, Cosmopolitan, and Selecta as one of the best massage therapists from coast to coast.